Occasionally I feel like tinkering around on Photoshop, so I Google Photoshop tutorials and follow the steps. Some of the stuff people can do is seriously awesome! There are tutorials to further make the image into line art (like from a photo into comic book characters) but it looked way too complicated. I can't even remember when I first start playing with Photoshop. I remember in Secondary 3 how we all used Paint to make stuff for our blogskins and we thought they looked so good already haha. 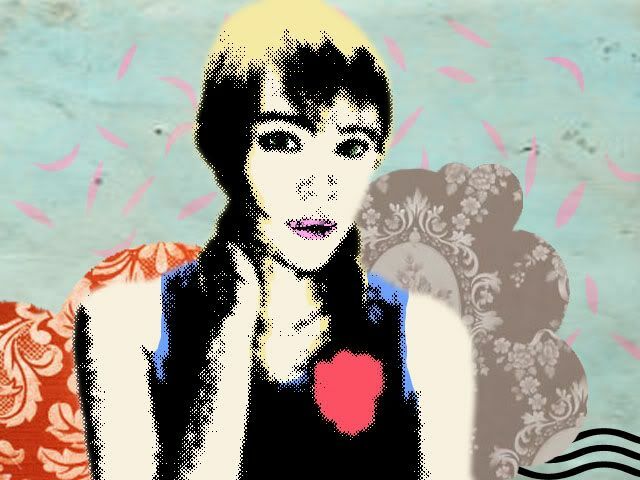 My very first blogskin (back when I was still sophielicious.blogspot.com - omg -) was a collage of Barbie dolls... The next one was on giraffes or kangaroos or something. Yeah I was always cool like that. Haha just for kicks you can go check out Sherry's old blogskins HERE. Back when she called herself Sherri hahahahaha. i dont have much t say about myself. and i rlly dont kno wht t say. all im going t say is tt. i do not do personalized skins. sec3 is a way too impt yr for me." Let me admit this: when I was in Primary 3 I thought dolphins were damn cool so I used to sign off as Dolphin instead of Sophie sometimes. Except that I didn't actually know how to spell "dolphin", so I was perpetually signing DOLPIN. Le Jetaime? wtf? that's " The I love you" translated to english. i think alaric wanted to be his gf because he thinks of you more of a status symbol than anything else. BAHAHAHAHAHA, OMG I should've deleted that stupid account!!! nice top babe @ alaric's place ! Sherry: Haha cute what! And it's actually quite impressive considered 95% of teens are total HTML noobs. i used to be crazy about dolphins when i was in primary school too. i bought glow-in-the-dark dolphins and pasted them all over my ceiling and now its kinda impossible to get off without peeling the paint off. lol. Anonymous: Haha I did that at my previous place, but with glow-in-the-dark stars. Can't remember if I ever got them off. hi sophie! my name is vivaleng and i recently applied to nus as a foreign student. and i have a question regarding their application system. i just wanted to ask you if you know if submitting an online appeal is mandatory or not? because i just uploaded my documents, payed the submission fee, ect. everything besides submitting an appeal, but my status is still set to 'not applicable'. and considering the deadline is already over, i'm kind of freaking out lol. thank you so much in advance anyways! this would really help me a lot! Viva: Hey Viva! I wouldn't know much about the case of foreign students but as far as I know, appeals are not mandatory and are for students who were rejected but wish to try again (applies to Singaporeans as well). I'm a bit confused, did you actually get an confirmation of acceptance before paying the fees etc? Although I would assume that if the system registers that you have fees to pay, it means you ARE in the system. The best would really be to call the faculty or the Registrar's Office (http://www.nus.edu.sg/registrar/) and check because you don't want to be uncertain about such things! No, I'm still awaiting a confirmation. As of now, I've sent them my online application along with my documents. I sent them an email, and just got a reply where they confirm that I'm in their system. So now I just have to wait, and cross my fingers that I'll get in! And hopefully I'll be a NUS student in a couple of months!